Justin Thyme is the main character of this story and lives in a huge mansion with his family and various other people. His family consists of his sister Robyn Thyme, Henny Thyme and Willoughby Thyme, his parents, Albion Thyme, his baby brother, and Eliza, a gorilla Henny rescued from one of her Congo missions. The others he lives with are Albion’s nanny, Nanny Verity, Professor Gilbert, Justin and Robyn’s teacher, and the Gilliechattans, Angus and Morag who are also the family’s gardener and housekeeper. Justin is a young scientist who makes all the income for his family. He thinks about making a time machine, and asks for permission from his father. Willoughby has had horrible experiences with time machines in his past, and is reluctant to let Justin build one himself. Willoughby claims that he has lost his memory when he was working for a top secret agency. He tells Justin about how his memory was erased and warns that someone may be watching him even now. His mother, Henny, goes on a trip to produce another episode of her hit T.V. show. On the way back from her trip, she gets kidnapped! Justin observes any clues about her disappearance and comes to the conclusion that the kidnapper must be living in Thyme Castle. Justin Thyme is a very good book with a great plot. The characters all have unique personalities, and make the book very interesting. The author used lots of advanced vocabulary words and included a dictionary in the back of the book to help us understand these. The point of the conflict was action packed Panama Oxridge always left me hanging at the end of the chapters, wondering what happens next. A strength with this novel is its use of puns. The name of the characters themselves are puns. 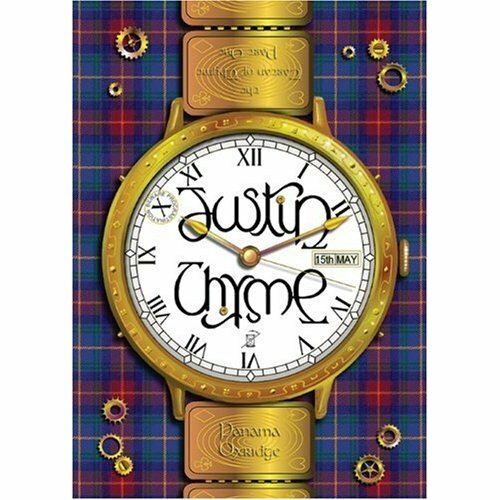 Justin Thyme is translated as “Just in time”. I would recommend this book to people between the ages of 12-15 years old. This book deserves a 4 out of 5. 1. Who did Sir Willoughby think was a spy? And why? 1a. He thought the farmer, Angus Gillichattan, was a spy because he is to “scottish” and always appears to be listening to their family (44). 2. What was Justin inventing? 2a. A time machine (16). 3. Who did Justin see at the lake bed? 3a. Nessiteras rhombopteryx, Nessie the Lochness Monster(45). 4a. Old Father Thyme because a man that looked like him came to their castle(50). 5. How did Sir Willoughby lose his memory? 5a. He was recruited for a top secret agent company, and he signed a contract that allowed them to erase his memory whenever they wanted to. His boss pressured him into fixing a time machine that was broken. Sir Willoughby knew how to fix it, but wouldn’t tell his boss so his mine was erased(70-74). 6. Who was Justin looking for and why? 6a. Justin was looking for a kidnapper that kidnapped his mother, Henny(132). 7. Who was the kidnapper? Do they know? 7a. The kidnapper is known as Professor Nation, and the Thymes do not know(143). 8. Why was Justin searching up “Procrastination” in a dictionary? 8a. Henny’s kidnapper left a note with the pseudonym, “Procrastination”. He was looking for a clue in its definition(191). 9. In the note about gorillas what were some of the main things stated? Why is this important? 9a. Gorillas do not lie, they throw things when angry, the more lies they hear, the more unsettled and nervous they get(190). 10. Why was Henny kidnapped? What did the kidnapper want? 10a. The kidnapper left a ransom note saying that he wanted Justin’s latest invention which was a time machine(221). 11. What was wrong with Robyn’s online boyfriend? 11a. He stated that he was 14, turning 15, but he was actually 59 because he was born in leap years on February 29th (298). 12. What was wrongly assumed about Polly? 12a. Readers assumed he was a girl because no pronouns were use in the story. He was also described as having long, blonde hair. His real name is Xavier Polydorus II(285). 13. Who was attacked and how? 13a. Nanny Verity threw up a paperweight that left her deeply wounded when it hit her head (250, 317). 14a. Knightly is a newcomer in the castle and is their butler. Justin thinks he is Professor Gilbert in disguise (276). 15. Why is Justin giving his dad the cold shoulder? 15a. Sir Willoughby lied about his memory loss to Justin his whole life. But if he didn’t, Justin and his family would have been in danger(345- 346).